The patented iQ Fusion 2® machine brings lean On Demand Packaging® to distribution and fulfillment, light manufacturing, and other businesses wanting to reduce waste, decrease dimensional charges, minimize costs throughout the supply chain, and create a seamless customer experience. 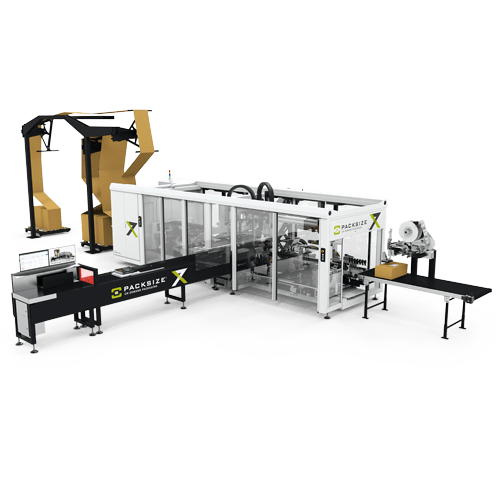 This pneumatic-powered machine and PackNet.Server® production and optimization software, along with Packsize accessories and consumables, provides a complete sustainable packaging solution to companies requiring customized cartons and faster throughput. The iQ Fusion 2® features a multi-patented horizontal outfeed and table that give a single operator the ability to transition from box creation to box induction without a significant increase in cycle time. This ergonomic enhancement also improves operator productivity. In the more compact iQ3™, Packsize retains all-of-the best functions and features of the IQ Fusion 2®. The iQ3™ custom box-making machine gives retailers with real estate and others struggling to manage the increasing volume of online orders an effective ship-from-store strategy. The iQ3™ can operate as a self-contained On Demand Packaging® system due to enhanced waste handling and the option to include an integrated air compressor. In addition to other carton closing and sealing adhesives, the machine can also incorporate the Packsize GL3™, an operator-friendly, box-sealing device that provides additional workspace utility and convenience. To improve the machine’s portability, the iQ3™ also features newly designed casters. The iQ Fusion 2® and the iQ3™ produce most FEFCO 100, 200, and 300 box designs, making On Demand Packaging® a smart choice for many of today’s packaging environments.